Kerala seems to be pulling all stops to foster entrepreneurship. Startup Village, a telecom incubator in Kochi formed last year as a public-private partnership, is planning to launch a centre in the US. To be based in Silicon Valley, it will act as a landing pad for Indian startups looking to enter the crucial US markets and also help them understand the startup ecosystem in that country. Sanjay Vijayakumar, CEO of MobME and promoter of Startup Village, said: "In India, there is a lack of product startup ecosystem and many startups entering the US are not aware of the ecosystem in the US, which is the technology hub. The new centre will provide opportunities for young entrepreneurs to understand the US market, interact with similar companies and tech leaders." 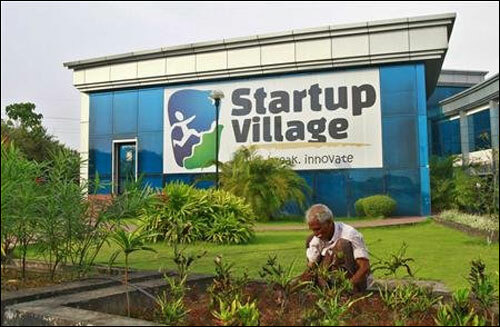 Image: A gardener plants seedlings at the entrance of Start-up Village in Kinfra High Tech Park in Kochi. Startup Village, which aims to incubate around 1,000 product startups over next 10 years, will also send student entrepreneurs to the US as part of a learning exercise. Recently, the Kerala government introduced a policy to give grace marks for entrepreneurial students for their projects. They will also be allowed to miss up to 20 per cent of classes, to pursue their projects. "With the government's new initiative to promote student entrepreneurial projects, we are seeing a lot more students taking this role," added Vijayakumar. 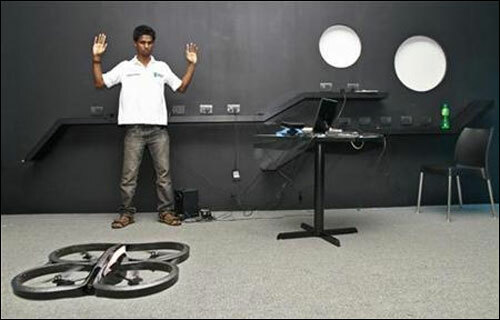 Image: Vivek, an engineering student, demonstrates as he tries to control a Quad-copter with his hand at the Startup Village. To support entrepreneurship, Kerala is now forming an angel network - Mallu Angel Network - to support startups. It plans to create a network of 1,000 successful Kerala-born entrepreneurs and industrialists from all over the world. These established businessmen will offer mentoring services to the startups. 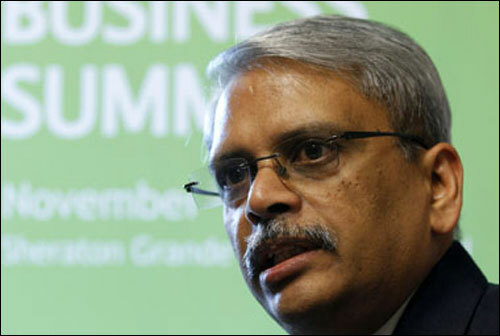 The network will be anchored by Infosys co-chairman S Gopalakrishnan, also the chief mentor of Startup Village. Other members of the network include Kerala Chief Minister Oommen Chandy, Federal Bank CEO Shyam Srinivasan, Bharti Enterprise Group's group director for IT Jai Menon and Geojit Financial Services' founder C J George, among others. "Mallu Angel Network will be a not for profit body like the Mumbai Angel Network. We are going to leverage the advantage of having wealthy and successful Kerala-born entrepreneurs to foster start-up growth," said Shaffi Mather, chief economic advisor to the Kerala Chief Minister. Other than the US centre and the angel network, the Village will set up Kerala's first angel fund - Startup Village Angel Fund-1 - of $10 million with an option to go up to $20 million, awaiting Securities and Exchange Board of India's approval.